Do you think that our server will grow in numbers or it will suffer, like many others a sort of migration ... or should be better called exodus to servers like Red Eclipse ... or just Red Eclipse cause the trend so far seems to be that. I think there will be a different plan in place. I feel they will create new servers and invite many to transfer there off lower populated servers, or maybe that some of those that occasionally hit standard like ours will be made into destination servers. There's that many different things that could still happen. I'll be moving my other chars across to Hydian Way for sure. My sub will run out in 10 days but I'm not gonna renew it before I see the result of the server transfer system and level of equilibrium it will bring, or not. Grandma wrote: I think there will be a different plan in place. I feel they will create new servers and invite many to transfer there off lower populated servers, or maybe that some of those that occasionally hit standard like ours will be made into destination servers. There's that many different things that could still happen. I'm afraid that won't be the chance. BioWare has around 217 servers acros the 3 continets. They stated that there won't be any new server or server merge of any kind. There are some speculation that so far assume that low population servers will give the option to transfer on medium population transfer and not heavy ones. The trush is that if you check the servers, you can count the number of "standard" load level server in the whole europe on the finger of a single hand. 2am now and Red Eclipse is on Standard. OUR server never been standard since the big fall of the 1.1 patch. Most of the people re-rolled since few days ago on red eclipse (for the europe side) and for the PVE server segment. I'm not taking into account fresh or german servers, which seems quite healthy so far. If what I've read so far will come to reality, few people will come to our server and mass people will go away just to settle on a more populated server. The end result will be pretty much the same as now if there is not a some sort of transfer regulation or, you can call it promotion from the dev himself. CoSK wrote: I'll be moving my other chars across to Hydian Way for sure. 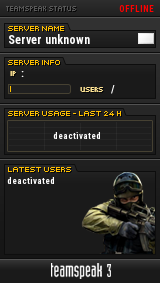 So far the general health of the server is quite low. Usually 23-30 people at a time on the fleet (republic) and few more, around 45 for the imps. Actually, this is what bioware has hinted at and they used the words 'new servers'. The only ambiguous thing is whether it is new hardware or new software changes that are meaning new larger servers or increasing caps on current ones etc. They specifically stated they had plans for 'new servers', see above comment though. They also stated that they have not ruled mergers out, simply that they will not be something happening in the first round of plans. So far, all speculations on where targets will be are just that, there's been no plans revealed by bioware or even hints no what they will do. It depends what time you look at them. I'm on the game every day and our server has seen some days where it has gone to standard in the past 2 months. The majority of the time it is light. Incorrect. Patch 1.2 saw our server at standard for over a week during prime times. There are a number of popular re-roll servers, I wouldn't put that at number 1, but it'd be somewhere in top 5. So far, besides about 4 sets of comments by Bioware, no-one knows what is happening and it's all wild speculation. Could be any number of solutions or changes put forward by them. It's certainly possible our server will be one people transfer off or onto. It's also possible that after one or two waves it could be merged. One of the things they have said is that it will all be targeted moves aimed at consolidating the population. However they're doing it, they'll be doing it ni a manner to try to get larger populations on single servers. Bioware's Latest Q&A wrote: Instead we are pushing hard on servers that are massive compared to the ones we launched with. Early tests show we’ll be able to raise the peak concurrent user cap above what it was at launch. Combining that with server transfers to enable players to move to these new servers and fill them to the brim, we should see some fantastic, vibrant communities develop where Group Finder will always be able to find someone for your content. Long and short of it - everyone who is guessing on official forums is doing just that. There's only been a few comments, which have made reference to new large servers. People have speculated as to whether that's simply new hardware platforms they are moving onto or whether a shift-around. They've even coined the phrase 'super-servers', even though bioware made no mention of that. People are speculating and making up their own plans for moving about - but until bioware tells us which servers we can actually move to and form, makes no difference. For INC's part, it actually makes little difference to us at the moment. We've currently got a fairly large pool of players between us and our allied guilds, which is also set to double in the next few days, so we're not struggling to get 16man content done on a regular basis and we're all grouping up each day for content. It also wouldn't make sense for us all to move until we knew what the plans were and how it would affect names and guild banks - as we have a lot invested in the one we have (over 9million credits). Would also want to know if possible to transfer an entire guild and maybe even co-ordinate and plan this with the rest of our alliance partners if it came to it. Either which way, we'll not make any choices on it until we know what is happening and then will consult our members and alliance partners. Until then, we can have fun carrying on the grouping and socialising we're having good fun with now. Anything that pushes the population up is a good thing, however it's implemented. Triggers renewal of skin cells, reducing the pain and fatigue in the legs caused by prolonged standing or varicose veins. Neven gel applied several times a day in painful places, and gently massaged. Grandma wrote: For INC's part, it actually makes little difference to us at the moment. We've currently got a fairly large pool of players between us and our allied guilds, which is also set to double in the next few days, so we're not struggling to get 16man content done on a regular basis and we're all grouping up each day for content. It also wouldn't make sense for us all to move until we knew what the plans were and how it would affect names and guild banks - as we have a lot invested in the one we have (over 9million credits). Would also want to know if possible to transfer an entire guild and maybe even co-ordinate and plan this with the rest of our alliance partners if it came to it. Either which way, we'll not make any choices on it until we know what is happening and then will consult our members and alliance partners. Until then, we can have fun carrying on the grouping and socialising we're having good fun with now. I'm sorry I had to quite this part for a couple of reasons. I gave a look at the forum, reading the rules for the 16man stuff, the hard modes, in short your scheduled events for the week and I saw that pretty much all the week is busy with stuff. Ops are out of discussion for me cause untill I reach lvl 50 and I'm half battlemaster geared up I'm useless. Which bring me to the second point. I've been playing the game pretty much since the pre-launch, first wave. I've been off a month while waiting for the 1.2 to go live and then back, including the 30 free days that bioware gave around. Do you know how far I was able to go with flashpoints? Maelstrom Prison. And since then finding a team is getting harder and harder every time. Now ... If I want to be part of the guild events and have fun I do need to meet the requirments that sadly piss me off. How am I supposed to get pvp stuff if 99% of the time I have to jump on random teams that does not coordinate for nothing? I'm used to play Battlefield and running lone wolf there you accomplish very little. All the time that I ask if someone want to do something, they are either busy with stuff, minding they own businnes or, ofcourse, doing pvp cause there is nothing else to do in the game. My question is quite simple and I'm I would like to know your point o view before I decide what to do. What is the point in being in a guild if I cannot get to play with players and do content together? NeveN wrote: Anything that pushes the population up is a good thing, however it's implemented. ExGemini wrote: I'm sorry I had to quite this part for a couple of reasons. I have offered to run you through flashpoints on several occasions and when I have been free to do so you decided not to at that time. I did say that you may have more luck with others as I tend to be a little busier than others most of the time. I did also say that the best way for you to get involved is to come and sit with us on the TS3 and get into groups, I do think you've only done this once. As for the requirements you quote - those are requirements for doing endgame bits and pieces, they make it very clear they don't apply to anything else. It's not always level 50 stuff on there and for a while we've not had anyone asking to schedule less-than-50 stuff, just people asking for help with occasional bits and pieces. The offer is there for people to request events or things they want to do - there's no point me scheduling to do a load of sub-50 things when you may or may not turn up and/or no-one else will. We can help, but to a certain extent you have to help us to help you - we can't do it all and second-guess what you might need doing. We used to schedule sub-50 things all the time, but now that there's very few people at that stage, no-one would show to us doing those - so it's far less a waste of our time to do that when someone wants to do that. There are many people who have come to us with no lvl50's and have only had low level characters. They've been on the teamspeak with us and they've asked for help or to group up at stages and people have done so. Regarding getting gear when you get to 50 - we've all worked hard to get sets of gear ready for all classes so that as soon as they hit 50 we can gear them up and start walking them through stuff - this has been widely publicised in motd's, in-game announcements, the forum and on teamspeak. As for PvP, there's little point in trying to organise groups for it at the moment. You're better off doing enough to get your gear and waiting till ranked WZ's are released - which is what we've stated is our plan all along. Sure, we've done the occasional group on there and we often do those of an evening by chance when a few of us say we'll do pvp we jump into a group together and go. There are a few people who have managed ok to get groups by asking in the alliance chat and we've been able to get them involved and in groups. I suspect you've probably not even subscribed to the channel as of yet - rod_inc. It has again been in every area possible we have to help people find it and get onto it. I've said to you every time I've spoken to you to try and get on the teamspeak more as you'll get far more from the guild that way. The fact is that it is very difficult to organise groups or strategies through content when typing in chat - I think I only know of one guild on the server that manage this way - everyone else uses voice comms - and typically, when you do so you don't type out what you've said - it'd usually get you killed. We can only help and point you in the right directions so much, you need to let us know you're there and wanting to do stuff if we're to see you want help/company. Grandma wrote: I have offered to run you through flashpoints on several occasions and when I have been free to do so you decided not to at that time. I did say that you may have more luck with others as I tend to be a little busier than others most of the time. I did also say that the best way for you to get involved is to come and sit with us on the TS3 and get into groups, I do think you've only done this once. I joined TS3 the first day when I was invited into the guild and after 20 minutes I get an headace while I was playing. I kept getting my attention split to what people was saying. As I said before I do not speak english that well and even the task of listen another language with different accents it hard to process if you do not pay attention. Plus I've to admit that I like the silence. I like to play a game and either listen to music I like or focus on the music sound effects (not much on TOR but you know what I'm talking about). I'm usually a social person but on my own term. I'm not mister nice guy every day 24/7 and there are times where I really don't want to talk to anybody unless is necessary. If you tell me plain and simple that TS3 is REQUIRED to be part of the guild, then I will have to rethink if I want to stay or not. I do understand the need for voice chat, as I said I played Battlefield 2 and 2142 enough to undestand that voice is fast and voice is required to organize a task fast. Grandma wrote: As for the requirements you quote - those are requirements for doing endgame bits and pieces, they make it very clear they don't apply to anything else. It's not always level 50 stuff on there and for a while we've not had anyone asking to schedule less-than-50 stuff, just people asking for help with occasional bits and pieces. The offer is there for people to request events or things they want to do - there's no point me scheduling to do a load of sub-50 things when you may or may not turn up and/or no-one else will. We can help, but to a certain extent you have to help us to help you - we can't do it all and second-guess what you might need doing. We used to schedule sub-50 things all the time, but now that there's very few people at that stage, no-one would show to us doing those - so it's far less a waste of our time to do that when someone wants to do that. Hehe I'm not complaning cause I'm not 50 and I need a buttload of stuff to do ops, that is the game requirments not much the guild itself. Grandma wrote: There are many people who have come to us with no lvl50's and have only had low level characters. They've been on the teamspeak with us and they've asked for help or to group up at stages and people have done so. Regarding getting gear when you get to 50 - we've all worked hard to get sets of gear ready for all classes so that as soon as they hit 50 we can gear them up and start walking them through stuff - this has been widely publicised in motd's, in-game announcements, the forum and on teamspeak. What is the point in being in a guild if you cannot run quests, flashpoints and stuff like that with other people in the guild? "People have been leveling" <- That is what you told me a week ago or so while I asked in Guild Chat if someone wanted to do any flashpoint. Well damn I'm trying to level up as well but in the process I don't want to have to skip game content. More than one person told me that in the end flashpoints are useless cause when you hit 50 you just switch to pvp gear and you are done. I didn't pick a PVP server, I picked a PVE server to have fun and enjoy the content. Grandma wrote: As for PvP, there's little point in trying to organise groups for it at the moment. You're better off doing enough to get your gear and waiting till ranked WZ's are released - which is what we've stated is our plan all along. Sure, we've done the occasional group on there and we often do those of an evening by chance when a few of us say we'll do pvp we jump into a group together and go. Tell you what. My sub will run out in about 10 days now or so. I do not intend to renew it untill I see how the transfer thingy rolls out. Between bugs, expectations and who knows what else will happens I really don't feel like paying EA/BioWare to screw my gaming experience more. If the server population will grow thanks to that, I will probably resub and start from scraps and see if I can do come flashpoints that I've missed so far, for a reason or the other. ExGemini wrote: I joined TS3 the first day when I was invited into the guild and after 20 minutes I get an headace while I was playing. It's not required - I've just always said it's by far the best way to get a group. People do look at chat - but not so much when you're concentrating on killing something or you're browsing a webpage/looking at ops. Or indeed when you've just picked up a bag of loot or walked through a door that makes your screen go into loading mode. All of these things mean that the chat can scroll by very fast and you can easily miss stuff. The PvP stuff you do leaves you very little time to type back also, as doing so means you've just died in the process. Often end-game stuff lasts for an hour at a time also, so you don't always instantly get out. Mostly all the points above - it's VERY easy to miss things in the chat. It only stays on the screen for a few seconds before fading out and quickly disappears if you're doing anything in game or are concentrating on what you're doing. Indeed. I think there's only a handful of people who are not 50 on one char at least now and they're rarely on at the same time. We all level alts too - I have one at 11, 22, 30, 31 at the moment in addition to my 50's. I play them bit by bit here and there. This is the same as others do. I've often looked at the guild window and looked at what levels other people who are online have characters at (all labelled up in member notes) and asked them if they fancy doing some levelling on that char of theirs. It used to be the case with PvP gear, however, that is no longer viable since 1.2 - you can't do that an ymore. They are now very separate portions of the game. People were indeed levelling and had been through the week in bits and pieces and indeed around the levels you were at. However, I think at that moment we were doing or getting ready for a large event - I think a 16man, so few would have been bale to switch to their chars to level without letting the rest of us down and us having to find that extra last person. The majority of INC do PvE, there's a handful who do PvP also. Pretty much - mostly based to the fact you have to wait ages to queue in a group and it disbands the group everytime you finish one. Makes it very annoying to play PvP in a group or queue in a group. It's one of the many things they are due to fix in 1.3 and have announced they are doing so. It's more the game forcing you to do that than anything else. Sub-50 PvP is fairly dead, over 50 PvP isn't too bad and warzones pop every 15mins or so - those two types of pvp are a world apart and so anyone who has a 50 tends to play PvP in that. I don't know if you're aware - but the other reason that people are often not up for doing lower level flashpoints is that when you hit 50 - they are a huge part of endgame - you have to run those constantly. So it's the case that we run those flashpoints every day in multiple groups at 50 - so it gets boring and annoying to do them lower than 50 now. However, I appreciate that for a first play through you can feel like you're missing out on story by not doing them and the rewards are good - which is why I offered to run you through a load of them - I didn't have a character anywhere near your level to do it on though, so was either a 50 or nothing. And yes, I'm busier than most because I'm always trying to help people out or group or organise things for people. Or indeed playing the game myself too! The times I generally have more time spare to do such levelling stuff is on a saturday early afternoon. There are a lot of details coming up for 1.3 and more coming out as we go on, expecting another announcement in the coming week with more info and have applied to have my character copied to the test server too. If you're not wanting to pay out that extra month to see jhow it goes, I don't blame you - but I will say that at 50 - which is where most of us have been for about 3-4 months now - it's not too bad and we get groups and flashpoints going every night. Whilst there may only be up to 10 people online on our guild, between the alliance there's a lot closer to 20 or so (atm, due to be over 40 shortly) in that channel in peak time and we have the alliance so we can more easily always get groups - it's the same for many guilds and they look for groups within before outsiders first. Grandma wrote: I don't know if you're aware - but the other reason that people are often not up for doing lower level flashpoints is that when you hit 50 - they are a huge part of endgame - you have to run those constantly. So it's the case that we run those flashpoints every day in multiple groups at 50 - so it gets boring and annoying to do them lower than 50 now. However, I appreciate that for a first play through you can feel like you're missing out on story by not doing them and the rewards are good - which is why I offered to run you through a load of them - I didn't have a character anywhere near your level to do it on though, so was either a 50 or nothing. And yes, I'm busier than most because I'm always trying to help people out or group or organise things for people. Or indeed playing the game myself too! The times I generally have more time spare to do such levelling stuff is on a saturday early afternoon. I did join that channel, you told me the first day actually but I'm afraid I completely forgot to do so on every character, cause I assume is not global, right? I've read some stuff about 1.3 and yes on the paper is promising, like it was 1.2 ofcourse. But for now I'll wait a little and see how things will turn out, not much for the 1.3 but for the server transfer thing mostly. I even started a nice gunslinger! I'm still kinda troubled by the cover system but I'm getting the hang of it.